Today, Hawai'i imports almost 90% of its food and all of its carbon based fuel. If a natural disaster prevented from landing in our harbors, or if the cost of shipping became prohibitive, there less than a ten day supply of food on the islands. History points to a solution. 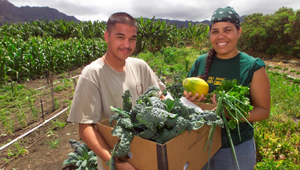 During World War II, Hawai'i provided most of its own food. Today, large plantation sugar and pineapple farms that dominated production are shrinking, and a return to more diversified agriculture (including production of bio-fuels) is possible. Hawai'i clearly has the potential to sustain its population, but escalating real estate values hinder efforts to achieve greater self-sufficiency. That's why The Trust for Public Land has developed partnerships with landowners and public agencies to conserve working agricultural/ranch, forest, and watershed lands to promote island self-sufficiency.